The Russian team has triumphed in the overall medals count at the gymnastics European Championships in Birmingham, England. The Russian girls returned home with six medals – two golds, three silvers and one bronze – leaving host Great Britain in second place and Romania in third. Ekaterina Kurbatov became a two-time gold medalist, winning in vault and in the team event. 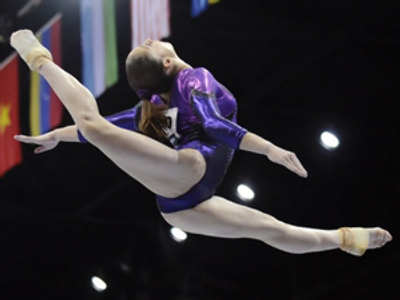 Alia Mustafina, who accompanied Kurbatova in the team competition, was second on the balance beam and the uneven bars. Anna Myzdrikova took silver in the floor exercise, while Tatiana Nabieva was third in the vault. The leader of the Russian squad, Ksenia Semenova, failed to win single individual medal in Birmingham.